We partner with faculty to bring expertise and assistance to plan and build your online or hybrid course. 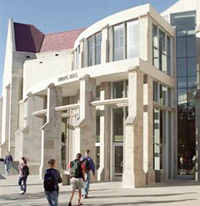 Whether meeting with us in our Budig office or at your location, the KU Center for Online and Distance Learning has staff available to assist you with a variety of teaching and learning resources. We offer instructional design and teaching technology integration to achieve your learning goals. We will start wherever you are to envision how a blended or online course model might work for your students. Please contact us at 785-864-1000 or onlinelearning@ku.edu to schedule a time convenient for you!